Key Holder -The World’s First Safest Key Holder with Technology Package ever made with 10 different functions. Wireless Charger -The World’s First Luxury Wireless Charger, classy Induction Charging System. The first charger which will decorate every room. Our objective is to combine newest technologies with the oldest, toughest and most natural material which was ever used by humans. Leather goods were always the markers of class, quality and luxury. Therefore, not only do we pay attention to the technological aspect, but we equally focus on the quality of product. All goods which we present are fully hand-made from the best Italian natural leathers without any saving on the material, so that each product is a synonym of luxury and withstands many years. What is Empire New York Solar Wallet? 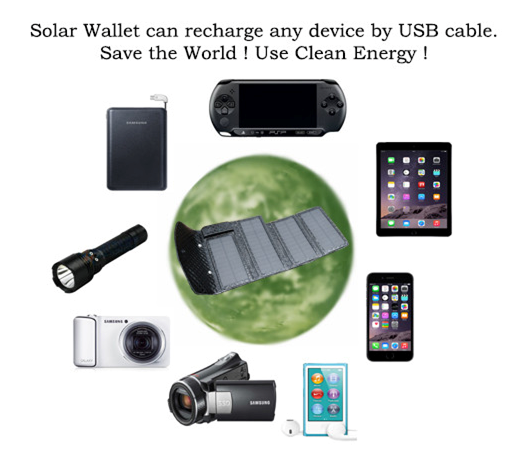 Solar Wallet is the most powerful solar charger in the world, which is not much bigger than a mobile phone and has a capability to charge it within the same time as a common charger. Charging an Iphone 6 during a sunny day takes only 2.5h. Not many producers mentions the fact that the most significant elements of chargers are solar panels. Our solar panels have the highest efficiency reaching up to 23%. Such panels are installed only in the newest installations. 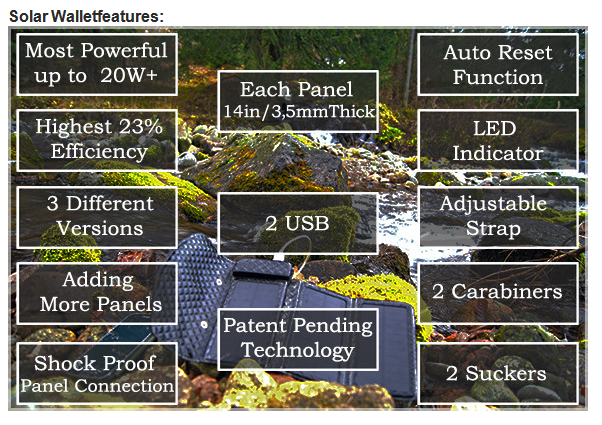 For comparson, elastic flexible panels have efficiency up to 7-13%, thus Empire Solar Wallet is the smallest, most elegant and most powerful solar charger in the world. We are the first company in the world which invented a way to enhance the power of charger by further 5W or 10W, which can be furtherly enhanced by 5W or 10W. At the same time, we have the most powerful, the smallest and hand-held charger ever made. The connection of additional panels is very strong, which favours us over other producers in the market using magnets or other solutions. Additional panels will not unfasten during jogging, hiking in the mountains, skiing, bike/quad riding or motorcycling. We paid much attention to the ways of fitting the charger so that its use is not limited by anything. Fittings are placed on two sides of the charger. We used a regulated strap, which can be shortened in any way. On the other side, there are two carabiners, which can be quickly clasped to anything and glass suckers, which can be used for example on a camp. What is Empire New York Key Holder? This is the only luxurious, safest and multifunctional key holder in the world, which firstly will not be forgotten anymore, secondly, can be used as a safe exclusive wallet, as it has a hidden RFID-blocking card slot. How often did it happen to me that I was looking for keys before leaving home? Keys have a mysterious ability to change places! Many times I am sure I put them exactly in a given place, and when I go out in a rush, it turns out they are not there. I am looking for it for 15 minutes around the whole house and cannot find them… The worst thing is that I cannot even call them… Finally, I manage to find them in yesterday’s trousers, jacket or among pillows. How often does it happen to you? Therefore, we created the safest and most elegant key holder that could have ever been created. Your keys will not scratch your mobile, tablet, glasses, console or other stuff anymore. You can safely put them on a glassy table or in a car and there will not be any scratches there.